My Germanness is going to come out full blast for this week's blog post. Additionally, I am going to be addressing aspects of folklore and superstition, things which I am not obligated to take stock in as a reporter. However, such stories can and do have simple morals behind them. The legend of the Christmastime demon Krampus is no exception, and it is about as severely German as you can get. In Central European tradition, Saint Nicholas, who is similar to Santa Claus, arrives on December 6 to reward children who have been good with gifts. While this function connects the two, Saint Nicholas has one major difference: he does not stuff the stockings of children who have been bad with coal. Instead, he has a counterpart in the malignant character of Krampus. As the photo above depicts, Krampus is a half-demon, half-goat being who is tasked with punishing the children who have been naughty. The night before Saint Nicholas Day, Krampus comes out from his hideout to perform his dastardly charge. 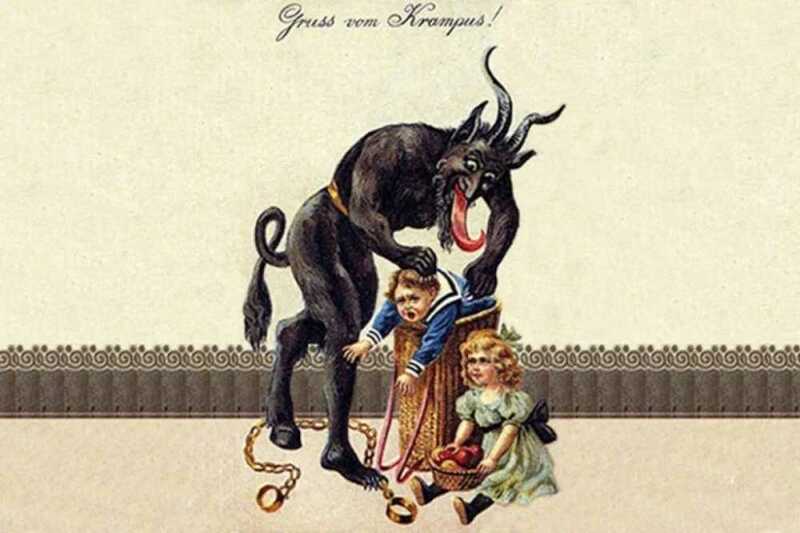 During Krampusnacht, or Krampus Night, he visits those children with a whip or switch in hand, and beats them with the intent to drive the naughtiness out of them. But for the especially bad, he will do something much worse. For those unfortunate enough to incur his full wrath, Krampus will stuff them into his sack and return to his lair to torture or eat them. But in all seriousness, Krampus' exploits are only part of a tradition. As such, he obviously became a scare tactic for German mothers to correct their children's behavior. What is interesting is that he has endured as a popular figure in Germanic cultures. So much so that an event called a Krampuslauf, where people dressed as Krampus participate in parades and scare children, has become a regular part of Christmastime traditions in Germany and countries which surround it. It's a normal rite that people over there participate in with eagerness, and I think that is because the threat of Krampus carries the same essential moral that we were told when we looked forward to seeing Santa Claus and finding presents under the tree. That simple moral behind this legend is that if you are good, you will be rewarded. If you are bad, you'll get yours - one way or another. Think on that as the evening approaches and Krampus begins to make his rounds tonight.